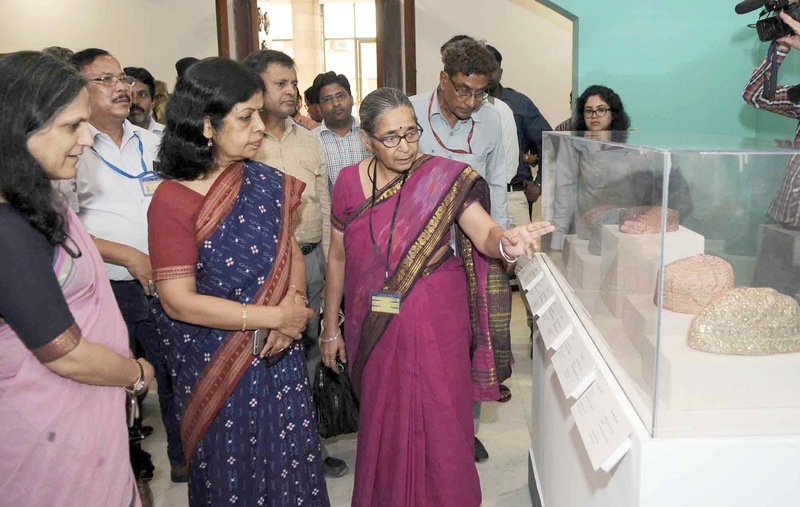 New Delhi: Rashmi Verma, Secretary, Ministry of Culture & Tourism inaugurated an exhibition entitled “Traditional Head Gear of India” organised by the National Museum in National Museum Complex, Janpath, New Delhi today. This small exhibition is arranged to showcase printed turban, embroidered dopalli and Maratha stitched cap and zardozi cap. Pagdi, pag, turban, topi, cap, headgear are the part of daily men’s attire, sometimes women too, along with Indian traditional wear. These were specially designed for occasional and ceremonial bases. 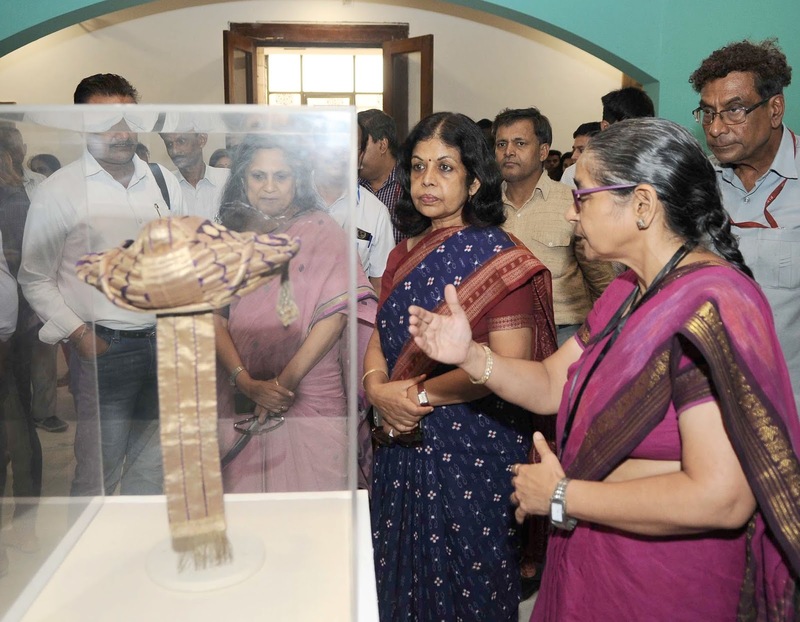 Headgears signify the social, religious and economical status of a user in the society. From muslin, cotton, silk and wool, variety of materials have been used for most ornamental and intricately decorated headgears and later on jewels were also added to ornate it. Each phase of Indian history show some distinct or peculiar style of wearing pag for example; Maurya-Sunga period evidences show the tying of pag in two stages, top-knot for covering the hair bun and then covers the head. During the medieval period also we witnessed the interesting types of headgear such as; Akbar’s ‘atpati turban’, was famous which was like a loosely worn, carefree style turban. It is believed that Shah Jahan introduced the ‘turban band’, which was tied above the band to secure the turban. It is believed that Aurangzeb use to make his own cap. The last Mughal ruler Bahadurshah Zafar’s ‘Chugani’ or ‘Chaugoshia’ cap has four raised points. Around late 19th and early 20th century ‘do-palli’ or ‘round cap’ or ‘topi’ in the northern region became very popular for daily as well as occasional uses. The ‘do-palli’, means two layered cap, which were stitched from one side and worn on the head, while the ‘topi’ remains circular and covers the entire head, which often been known as skull cap. Nizam’s in Hyderabad (South-India) introduced in ‘dastar’ which was the neatly arranged turban, looks like a stitched cap. During his period as per the status of minister the colour of dastar was decided especially for courtly attire. Famous Maratha’s turban and Rajput turbans had their distinct feature for fabric, colour, design and ornamentation. They introduced the stitched headgear with full head covering, little fabric hanging at the back and the third is hangings, which use to be pearls to semi-precious stones and glass beads.